If you are a Pag-IBIG Fund member, it's highly recommended that you apply for a Pag-IBIG Loyalty Card. The card costs almost nothing since you will only have to pay 100 pesos for it. Furthermore, the requirements for it are quite simple. All you need is your Pag-IBIG Fund Membership ID Number or MID. If you don't know or you have forgotten your MID Number, just go to the nearest Pag-IBIG Fund branch nearest you and inquire about your account details. 1. The very first thing you should do is visit the official website of the Pag-IBIG Fund or Home Development Mutual Fund (HDMF) and download the Pag-IBIG Loyalty Card application form. 2. Fill up the form then go to the nearest Pag-IBIG Fund branch to submit your application form. Branches have what they call enrollment kiosks. Go directly to one of these kiosks. 3. You will be directed to the branch cashier where you will pay the card fee which is one-hundred (100) pesos. 4. Your picture will be taken. You will be asked to validate all your information. You will be asked to sign your original hand signature. 5. After completing all of the steps above, you now have to wait. 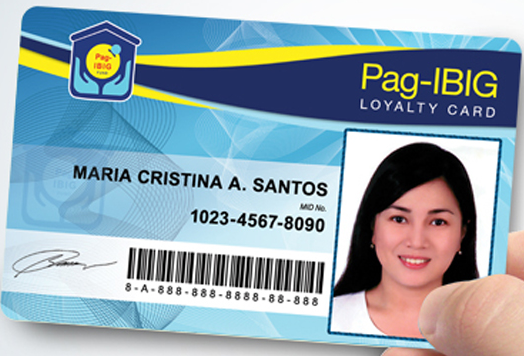 Your Pag-IBIG Loyalty Card will be processed and made available between fifteen days and thirty days. Sometimes, the processing of the card can take over a month. It's advisable that you regularly check the status of your card. This is what the Pag-IBIG Loyalty Card looks like. 1. It offers special discounts and rewards for all Pag-IBIG members when they pay for medicine, tuition, fuel, etc. For a complete list of participating partners, please visit the corporation's official website. 2. It can be used as a Pag-ibig Loyalty Card valid ID for government and private sector transactions.